GARDENA — A book event for “The Go For Broke Spirit: Portraits of Courage” will be held on Saturday, Nov. 17, from 1:30 to 3:30 p.m. at the Gardena Valley Japanese Cultural Institute’s Nisei Veterans Memorial Hall, 1964 W. 162nd St. in Gardena. There will be a panel discussion with photographer/co-author Shane Sato, co-author Robert M. Horsting, 442nd Regimental Combat Team veteran Don Seki, and others to be announced. Working with oral historian Horsting, Sato created the first book and a traveling exhibit. They are planning a second book. He has focused mostly on veterans on the West Coast and in Hawaii but wants to expand the project to include those living on the East Coast and in the Midwest. 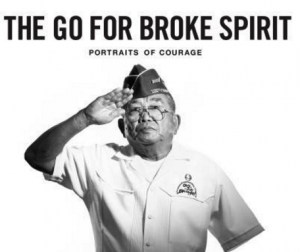 For more information, visit www.thegoforbrokespirit.com. Admission is free but donations are appreciated. To RSVP, call (310) 324-6611, email [email protected] or visit http://jci-gardena.org.